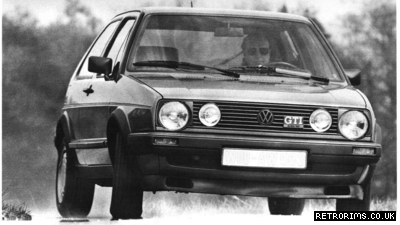 The first Mk2 GTI I drove was a left-hand-drive car that had been personally imported to the UK. Coming out of a Mk 1, you were instantly struck by the more solid and substantial feel of the newer car. It was much quieter and more comfortable on the road, showing how standards changed during the nine-year lifespan of the first Golf. Although the early Mk2 GTI s had a similar engine to the late Mk l cars, small revisions to improve low-speed torque even further had left it a slightly lower-rewing unit. Extra size and weight also made the car feel less nimble. The longer-wheelbase Mk2 is more stable in hard cornering especially in the wet or on loose surfaces. On the race track, though, the new car showed its edge. With a longer wheelbase, it was less prone to oversteer on throttle lift-off even though it would still lift its inside rear wheel off the ground in very hard cornering. The car felt more stable and was very forgiving even if its driver was not quite up to scratch. I remember one incident at a GTI Drivers’ Club meet at Goodw ood w here one ham-fisted pilot got it totally wrong and went into a corner too fast (for him) and on the wrong line. Following behind, I saw him dangle a rear wheel in the air, lock up the other rear wheel in a puff of tyre smoke as he attempted to lose speed, and more or less manage to collect himself as the car barely deviated from its line. In many other cars, the driver would have left the corner backwards, but the GTI had enough in reserve to save its hapless driver from that ignominy. Despite sporting spring and damper settings, the GTI Mkl had a comfortable ride and the occasional bottoming out at the front was more heard than felt. The ride quality ofthe Mk2 was even better. The longer wheelbase made its contribution to stability and ride, and longer wheel travel in the suspension, with re-rated springs and dampers, resulted in a chassis that took all road surfaces in its stride. The most important thing for British owners, though, was that the RHD version had been designed-in right from the start. ‘This meant that RI ID cars had a 182 different bulkhead with the brake servo moved accordingly, as well as a proper RHD wiper mounting too. With ventilated discs in front, and solid discs at the rear in place of the drums on the Mkl , the new GTI dramatically extended the braking confidence window for its drivers.